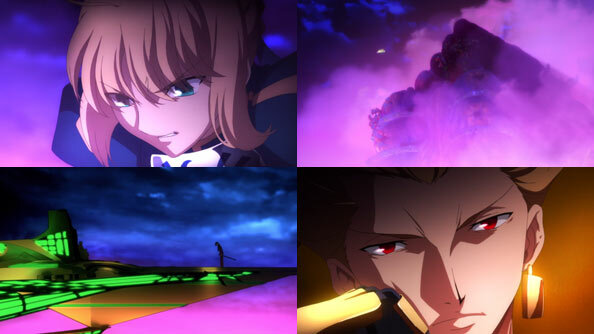 The Alliance to Destroy Caster’s Monster (ADCM) doesn’t net great results: Neither Saber, Rider or Lancer can cause any damage to Caster’s monster, as it possesses extraordinary regenerative abilities, like a flan that can reassemble itself faster than you can cut it up. 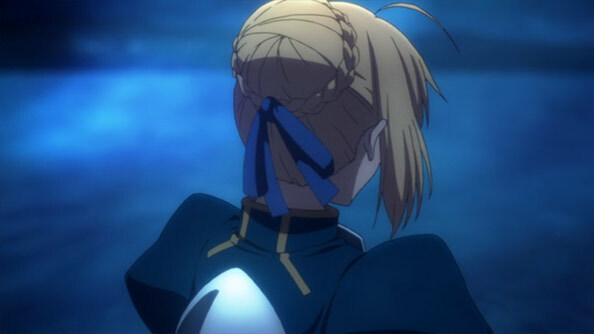 Archer watches the battle imperiously from above in his extremely cool aircraft, and expresses his disgust at the “mongrels” futile flailing below. 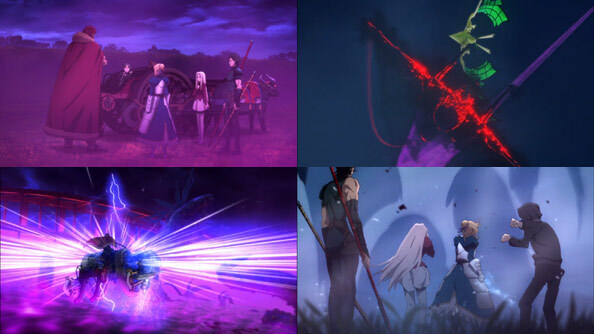 Tokiomi uses all the fancy submissive language he knows to try to get Archer to intervene and bring the monster down, but after four of his swords do no more than the other attacks (and are contaminated in the process), Archer declines to sacrifice any more. 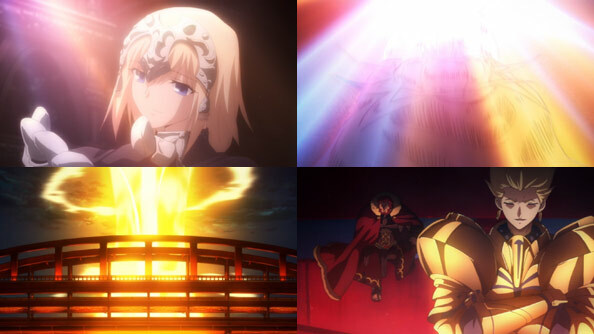 As the monster nears the shore, more and more innocent bystanders bear witness, making this an unmitigated disaster for the Holy Grail War and its backers. A pair of JASDF F-15s join the battle, but have no idea what they’re in for. 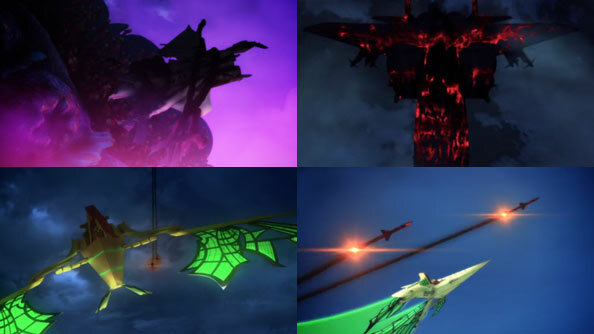 One gets plucked out of the air by the monster’s tentacles, then eaten; the second is “commandeered” by the newly-arrived Berserker, who engages in a fantastically wild yet balletic dogfight with Archer—as if possessing a fighter jet wasn’t cool enough. Berserker’s movements are extremely chaotic and unpredictable (as are his missiles), but Archer is able to counter every attack and stay a little bit ahead, glad that someone is entertaining him. 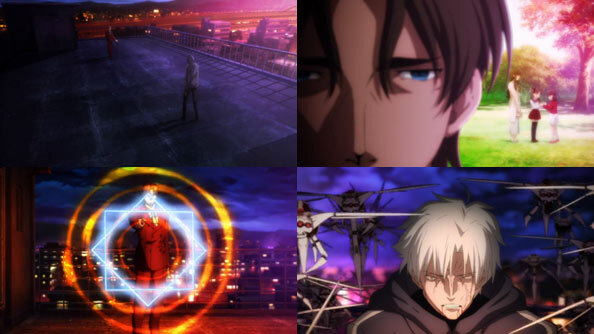 With their Servants fighting each other instead of the monster, Tokiomi and Kariya decide to have a duel of their own, which had to happen some time. Kariya asks how Tokiomi can call himself a father for giving Sakura away to the Matous, but Tokiomi not only carries a clear conscience, he’s delighted, for the sake of his illustrious noble family, that both of his daughters have the opportunity to become great mages who find “The Root”; never mind that only one of them can. Kariya is sick and tired of future generations suffering due to the cruelty and brutality of mages, so he’ll kill them all. It’s Toosaka magic vs. Matou…bugs. 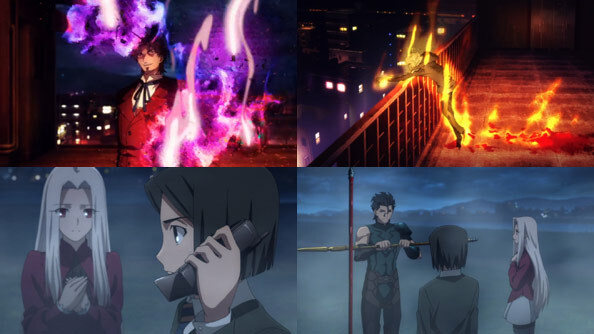 Finally we have Uryuu Ryuunosuke. Good-looking, cheerful kid; would make a fine protagonist if he wasn’t also a child serial killer. 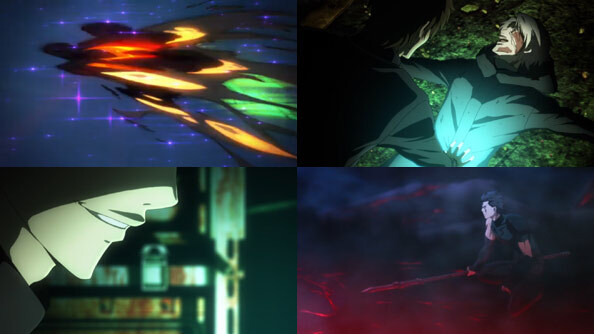 As he laughs and celebrates what her Servant is serving up for God, he leaves himself wide open for Kiritsugu’s sniper round. But wouldn’t you know it, he’s not upset about being shot in the stomach, he’s delighted as well, lamenting that “what he was always looking for” was right under his nose this whole time, in his own guts. Alas, he had to die to find “it”, and only got to enjoy the realization for a few moments before Kiritsugu takes the headshot. 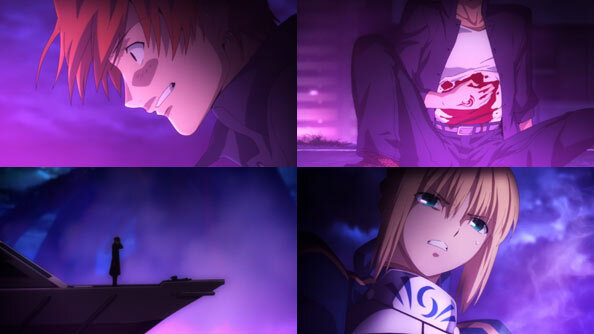 For all of the flash and impressiveness of the Servants’ and their Masters’ abilities, all it took to grab control of the situation was some stealth, a rifle, and a couple bullets…if only it were that easy. 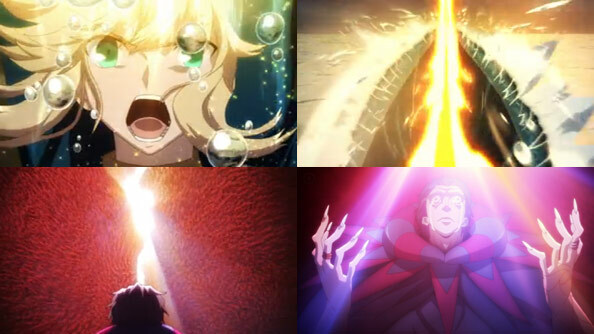 Caster and the monster don’t vanish immediately following Uryuu’s death; and as they’ll reach shore long before they do, there’s a real possibility they’ll be able to “feed” on the gathering crowds, sustaining physical form from the absorbed mana. 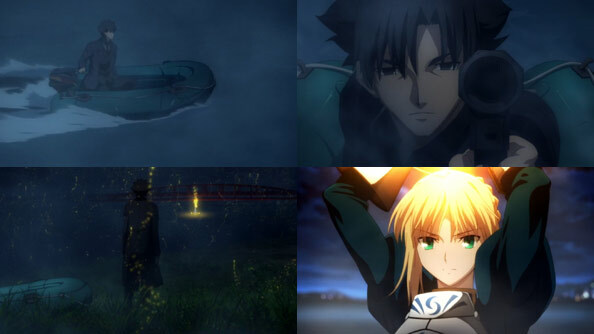 Uryuu may be gone, but to get rid of Caster’s monster, Kiritsugu knows they’ll need something only Saber has—an Anti-Fortress Noble Phantasm. The only problem is, she can’t use it with the wound Lancer gave her. 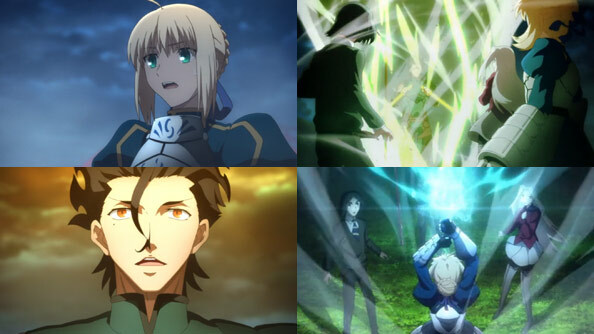 In order to defeat the monster, it would seem she and Lancer must duel, and Lancer has to lose.